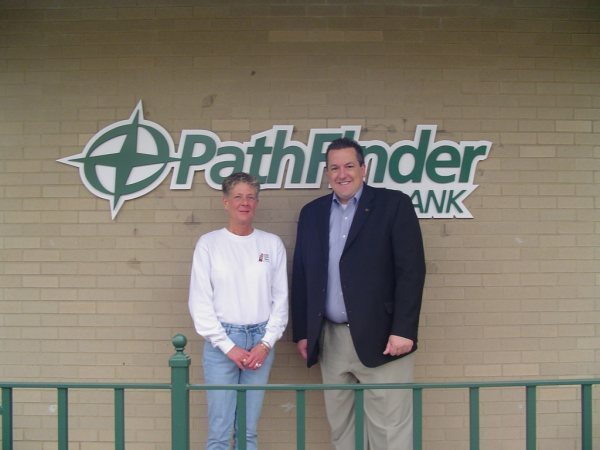 Long time supporter Pathfinder Bank is one of the sponsors for the 11th Annual Oswego County Hospice Cup Regatta and Walk/Run for Hope on Saturday June 12 at the International Marina/Oswego Yacht Club. The days events include the 5K Walk/Run, sailing races on Lake Ontario and a public reception at 4 p.m. featuring a Shore Dinner catered by the Blue Moon Grill and entertainment by the Cortini Brothers. Pictured above are Debbie Bishop, Friends of Oswego County Hospice and Jim Dowd, PathFinder Bank. For more information on the Hospice Regatta, call 343-5223 or visit www.friendsofhospice.org.